2.2. 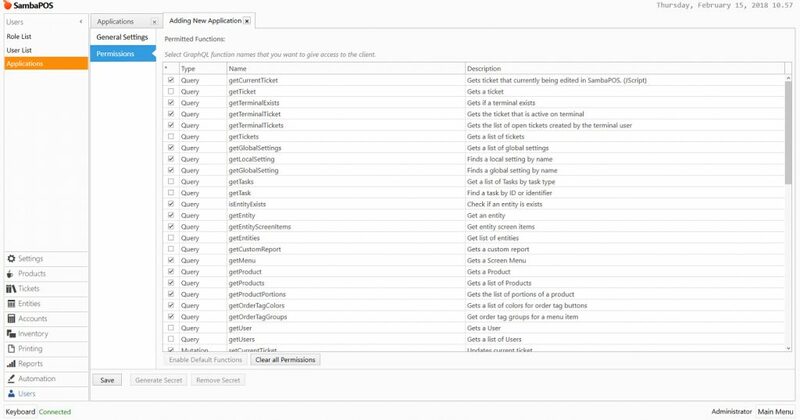 How to Configure API Settings and Activation on Gloria Food Website. SambaPOS 5.2.3 or above version. Should be started with these configurations. If you don’t have SambaPOS – OnlineOrder Integration License, you have to purchase a license by using SambaPOS CP website. To Download Online Order application click here. Your Online Order Integration Module License and SambaPOS V5 Pro license have to be defined under the same e-mail address on our CP website. If you don’t have an account on Gloria Food (www.gloriafood.com) website, you need to start by creating a new account. After creating the account, go to Other section from left side of Gloria Food menu. (1). Click on Enabled integrations section. 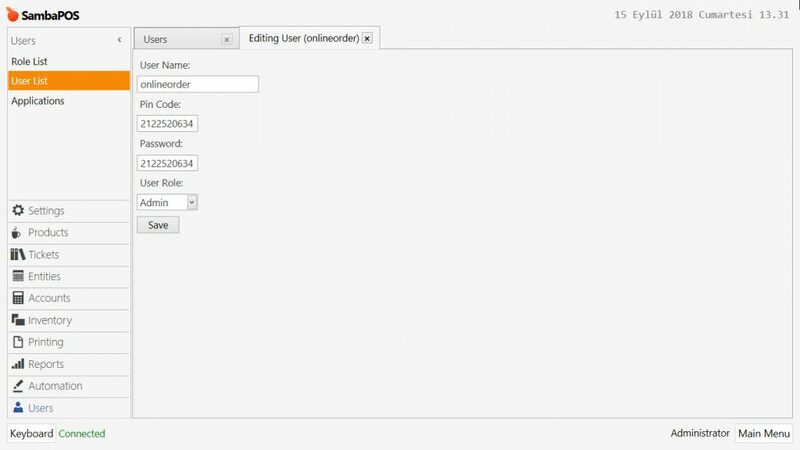 (2) Click on Enable custom integration button. (3). 2.2. 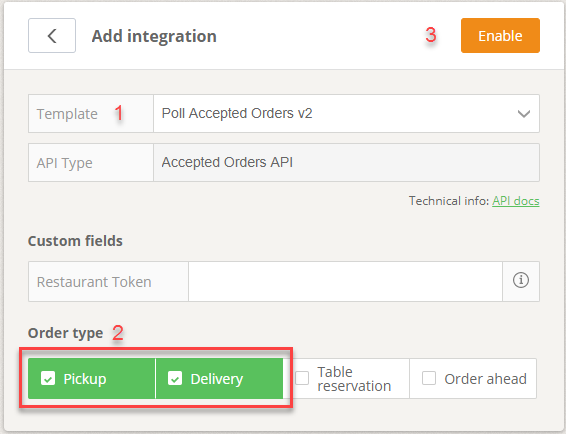 How to Configure API Settings and Activation on Gloria Food Website? 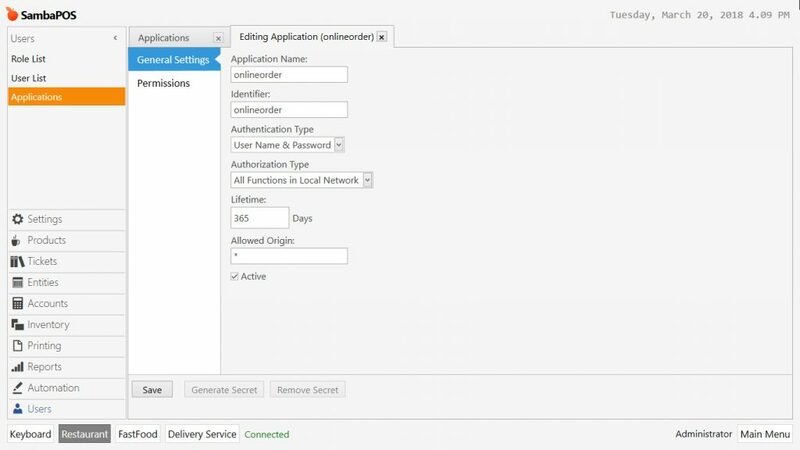 After clicking on Enable custom integration button, API creation page will be seen. 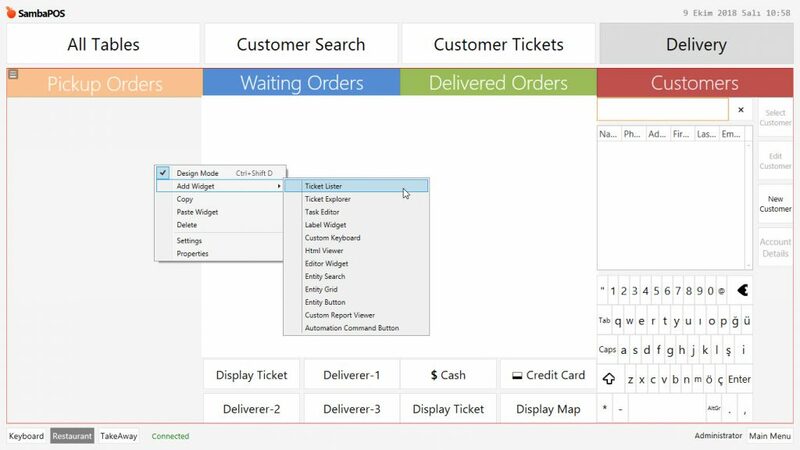 In the screen from Template (1) section, select Poll Accepted Orders v2 option. 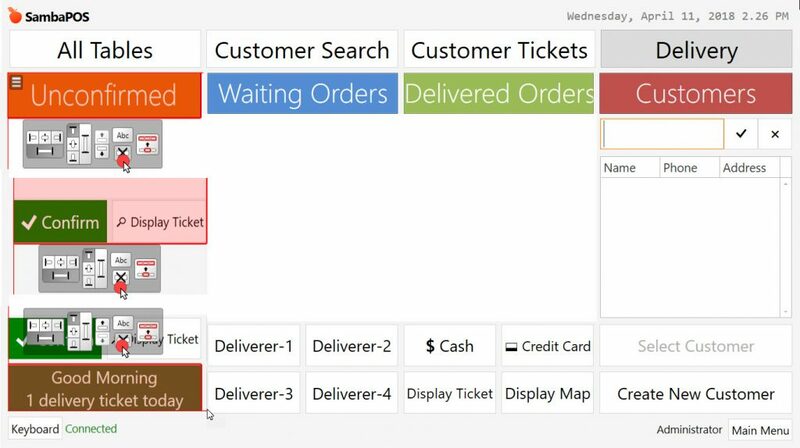 From Order type field select Pickup and Delivery (2) and click on Enable button (3). 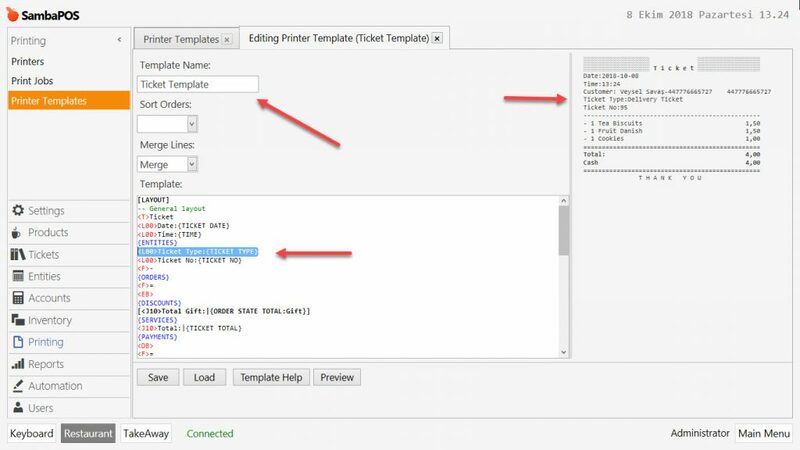 After clicing on Enable button the screen will be refreshed automatically and created API Key (1) will be seen as “Restaurant Key”. 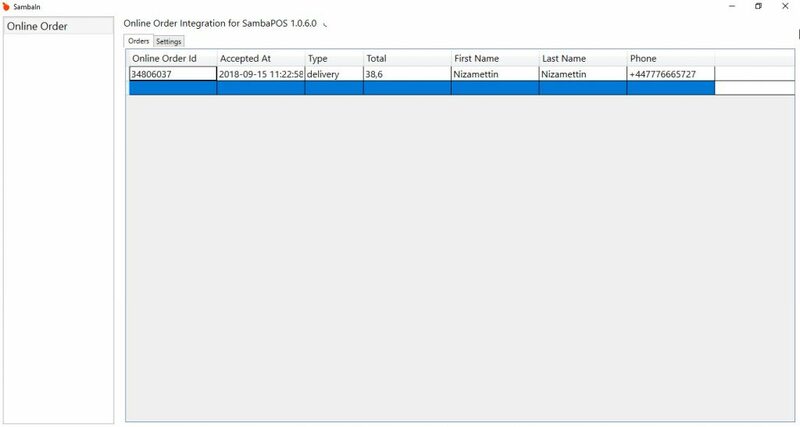 This created Key will be used for configuring the SambaPOS Online Order Module on further steps. Check the SambaPOS Main License status. 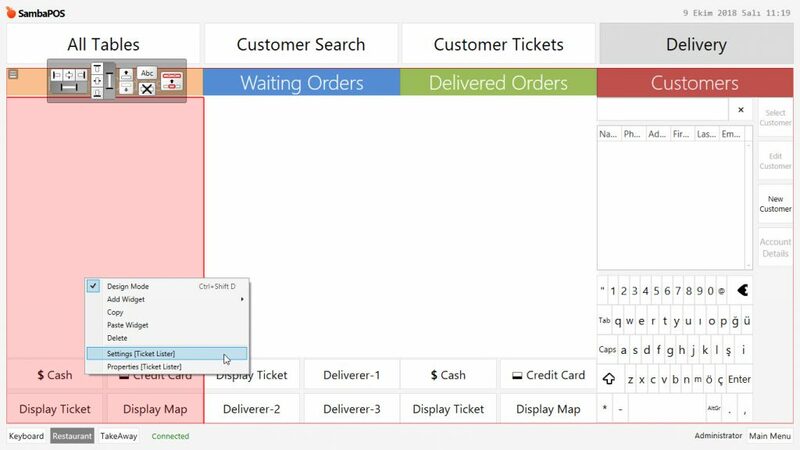 Online Order Module uses SambaPOS Message Server for communication. You might be using SambaPOS Message Server with default settings. If you don’t use Message Server or if using it with different settings than default in this case you have to configure necessary settings by following below explanations. 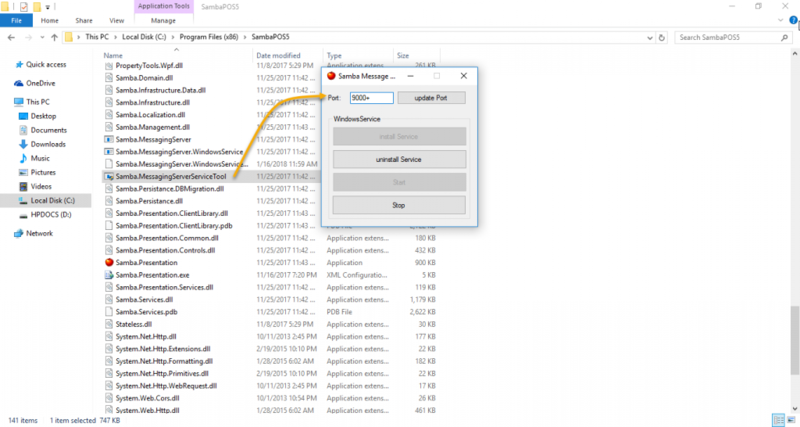 To configure Message Server Settings, execute “Samba.MessagingServerServiceTool.exe” file which is located in the directory that SambaPOS is installed. Note: Port has to be 9000+ By checking image below you can see how it is supposed to be simply configured and also notice that it has to be on Start status. 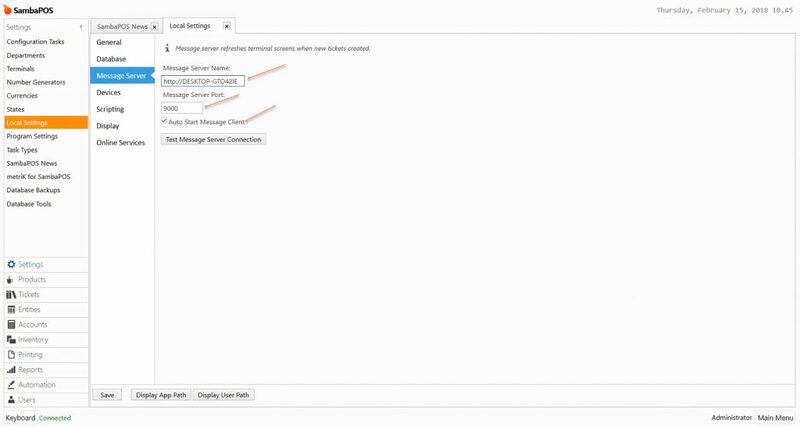 Message Server settings are supposed to be configured also in SambaPOS by following the settings above. Go to Manage > Settings > Local Settings > Message Server, in here perform the mentioned settings and click on SAVE button. 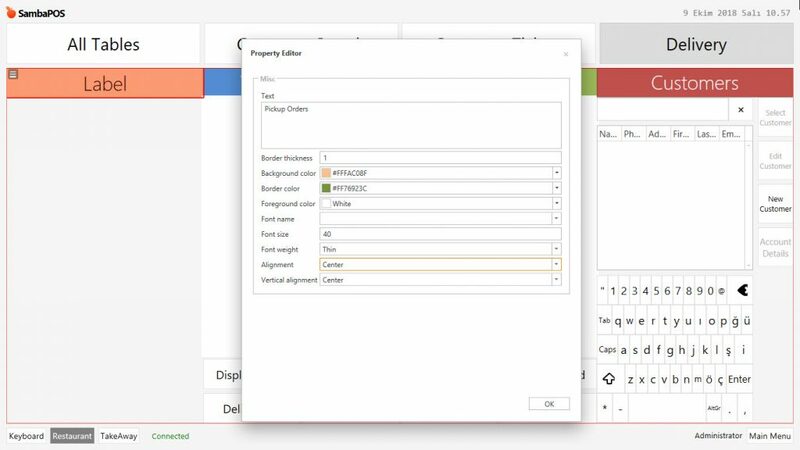 After completing pre settings, it is necessary to prepare the screens which will be used in SambaPOS and the needed procedures automatically by installing Configuration Task. 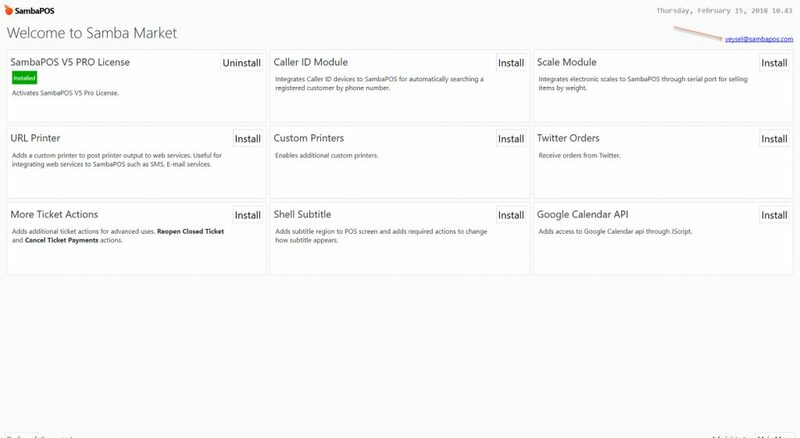 Go to Manage > Settings > Configuration Tasks from here click on Advanced Delivery Screen Setup link and perform the installation. This installation automatically creates all the necessary SambaPOS definitions and the screens. 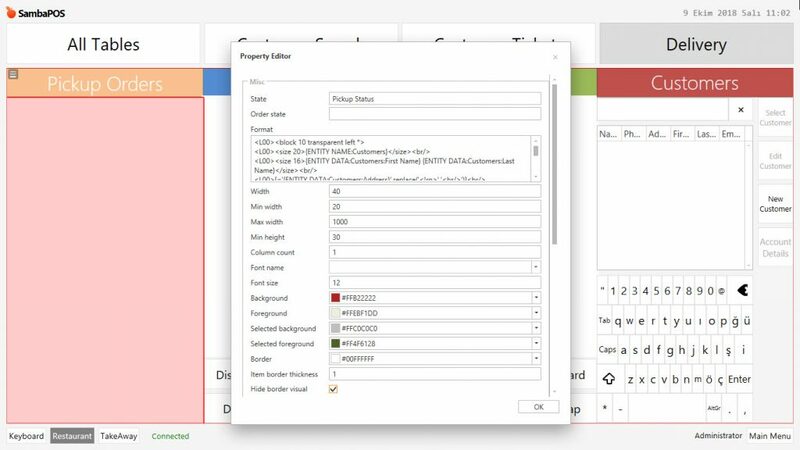 In here there are some unnecessary parts, (Unconfirmed Label Widget Window) so that you need to remove them from entity screen. 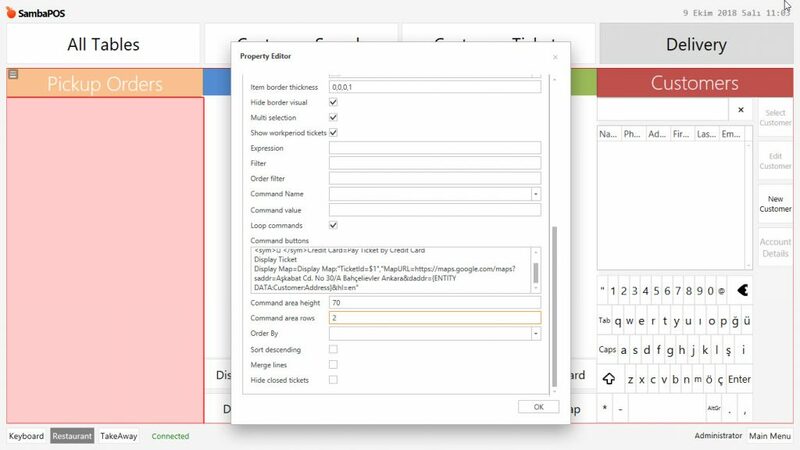 Open the design menu by right clicking of mouse and remove those 3 parts one by one. 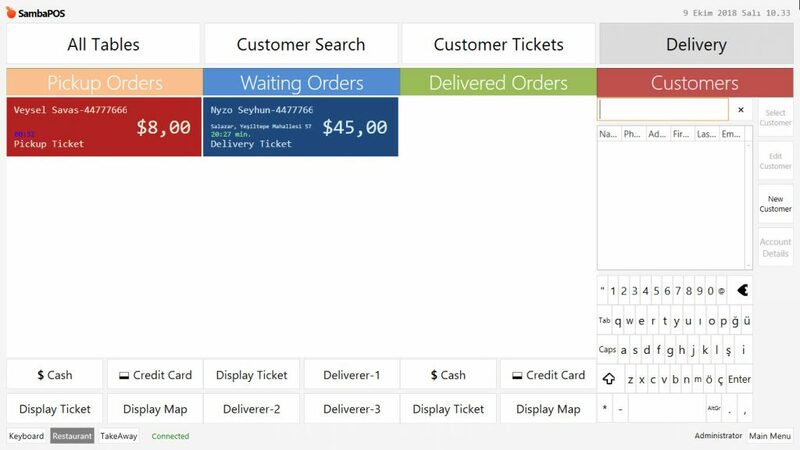 To be able to display the orders as soon as they are received, you need to change Auto Refresh Interval from 0 to 1 for both Waiting Orders and Pickup Orders fields. 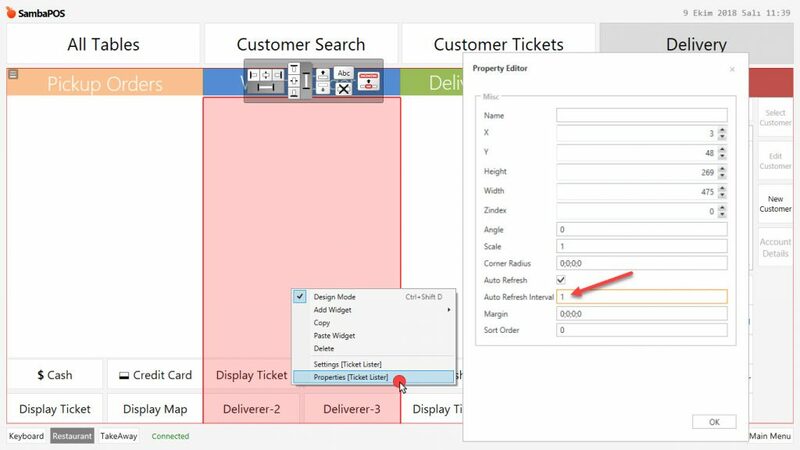 Once you finished configurations close design menu by right clicking mouse so that changes will be saved. 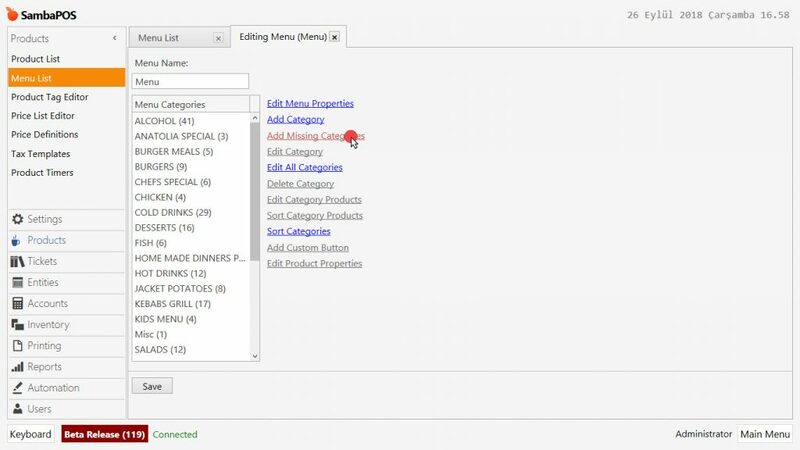 Note 1: After completing necessary editings, go to Manage> Entities > Entities from this menu, add as many as needed Delivery Service Staff. 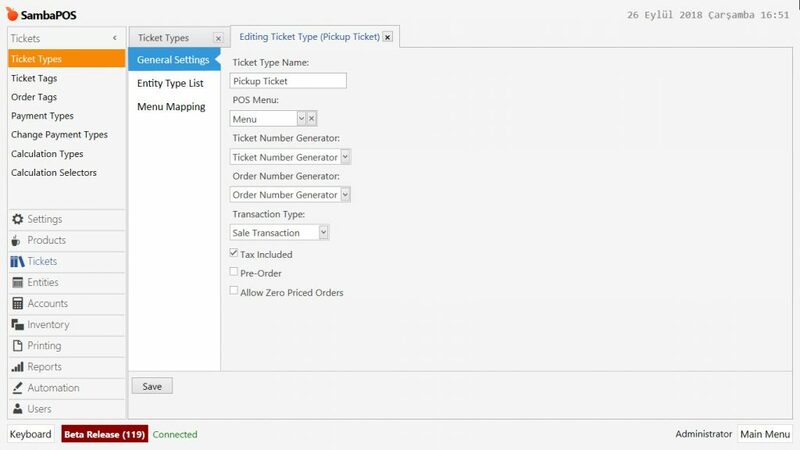 Note 2: Manage > Tickets >Ticket Types from here click on Delivery Ticket link and check the Tax Included box is selected or not, if not then select it. After completing necessary editings, click on Save button. 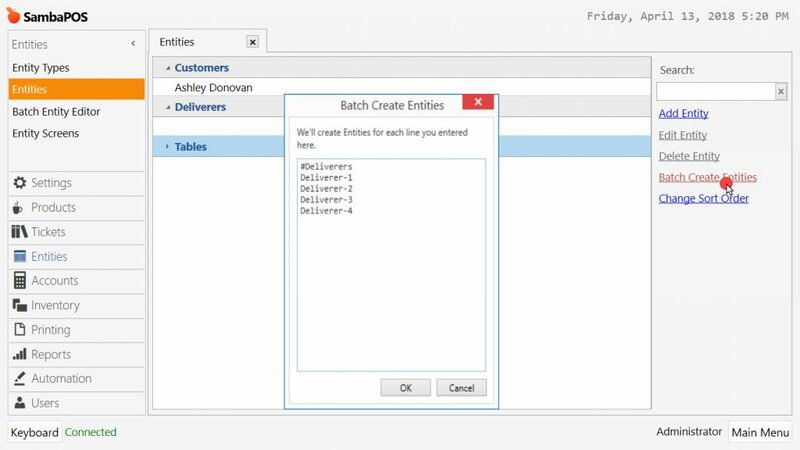 Go to Manage > Entities > Entities > from here click on Batch Create Entities link, in the window put # symbol and create your Deliverers. After completing necessary editings, click on Ok button. In Permissions section click on Enable Default Functions button and save the Application by clicking on Save button. It is necessary to create a new User for Online Order. This User will be used for only communication between SambaPOS API and Online Order Integration. It must not be used for daily working periods. 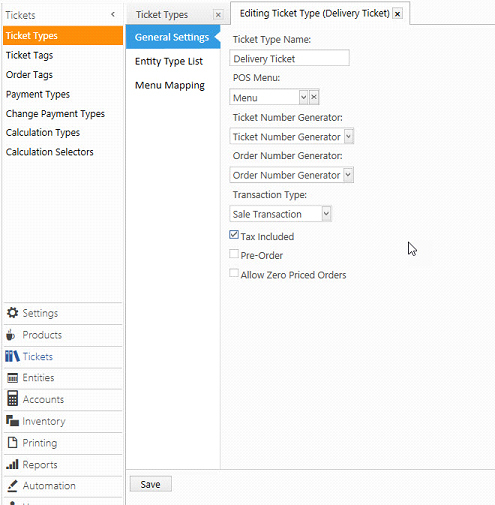 Go to Main Menu > Manage > Tickets > Ticket Types > here click on Add Ticket Type. After completing SambaPOS definitions, install the Online Order Integration Module which can be downloaded from here. 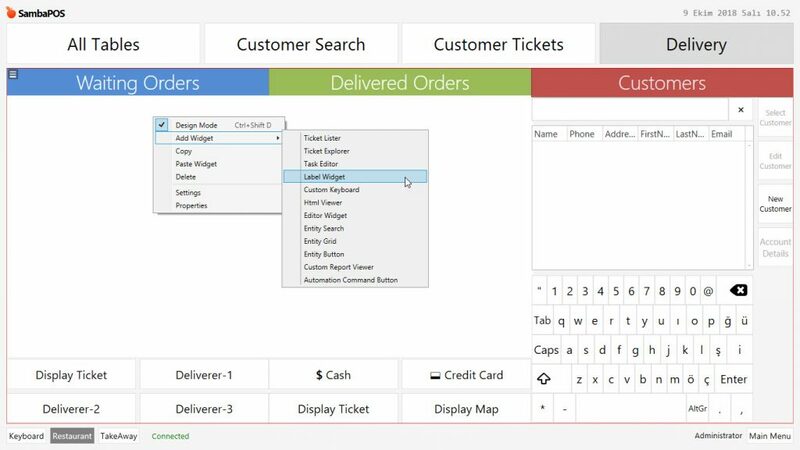 When the Online Order application executed for the first time, settings page will be appeared automatically. Configure the SambaPOS settings section like in the image below. When you clicked on Save button, if you got the license and if your settings are correctly done, SambaPOS Settings Section will be covered by a Green Frame. COPY the Restaurant Key which is explained in article 2.2 of this document, (API Activation on Online Order ) paste it into the Online Order Appkey section. 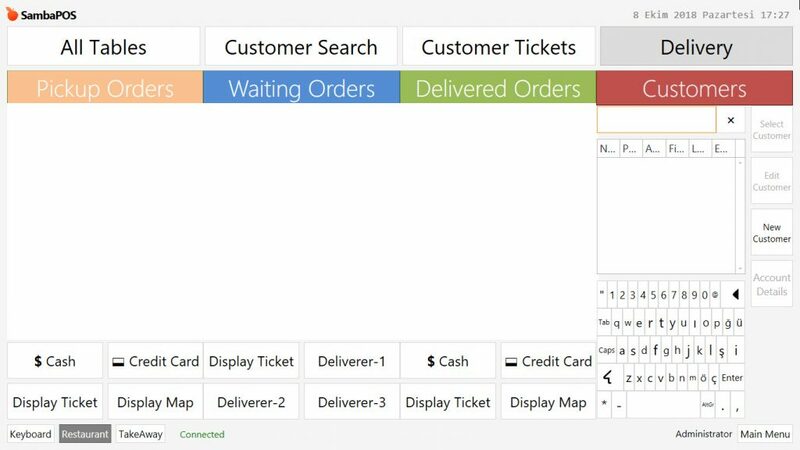 Click on Save button, when connection established Online Order Settings section will be covered by a Green Frame. When you click on Fetch Menu button, all the menu categories and products that you created on Gloria Food, will be automatically added into SambaPOS. In order to savethe changes, click on Save button. 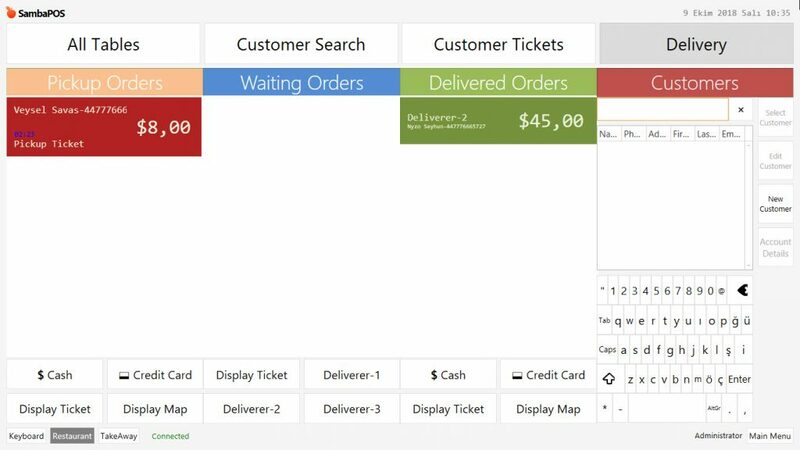 Go to Main Menu > Manage > Products > Menu List > here double click on Menu, click on Add Missing Categories button and then select Yes in the confirmation window. In the Other Settings section, when you select Logging option, system will be saving errros to the logs. The orders which confirmed through GloriaFood Mobile application, will be start displaying on the Orders table automatically. Received Pickup Orders will be coming to Pickup Orders Field, Delivery Orders will be coming to Waiting Orders field. For the Pickup Orders, when the ticket selected and payment received, it will dissapper from the window. 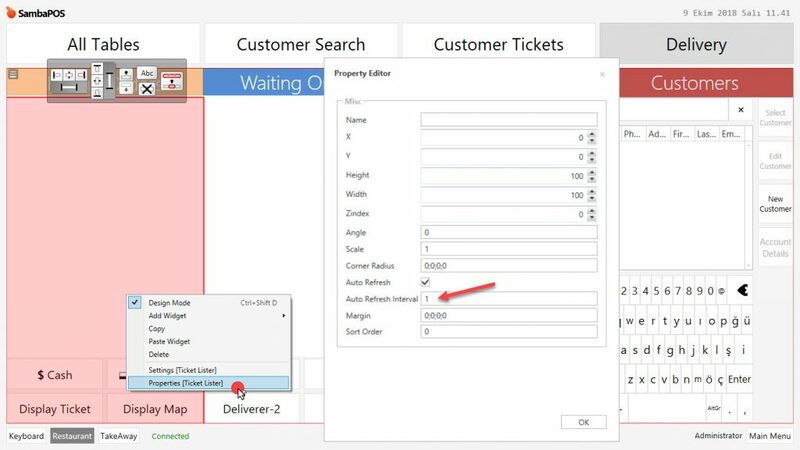 For the Delivery Orders, when the ticket selected and assigned to a deliverer, it will be transferred to Delivered Orders section.